Submitted by Tim on Thu, 10/20/2005 - 21:13. 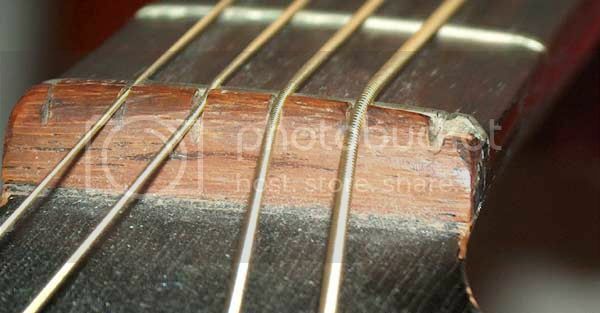 I was given an old arch top f-holed acoustic, the stradle and machine heads were missing and the nut is split. The guitar has a 'Framus' transfer under the lower f-hole and the headstock seems to be the right shape for Framus. My problem is I've been chopping and changing the guitar to suit my style (4-string), so far I've only altered the missing bits but the nut is next and I just want to know I'm not messing up something rare/old/etc. On the back of the headstock appears to be stamped: 14027. I've been to the Framus site but it all seems to concern the new electric (Washburn) guitars and amps, VintAxe doesn't seem to cover them...any suggestions? Posted by glw on Thu, 10/20/2005 - 21:35. 4-string? Out of interest, how are you tuning that? Is it like a tenor guitar tuning? Posted by Tim on Thu, 10/20/2005 - 21:43. I'm a bassist, I basically carry this guitar around the house and play blues on it, I only need those four for blues runs and it means I can have them 16mm apart at the bridge (same as my Aria) but the taper is crazy as the nut is still original. Hopefully (odd as it sounds) the guitar won't be worth much and I can make a new nut giving the strings the same taper as my bass, don't think I'll ever put it down then! Posted by SB on Fri, 10/21/2005 - 01:54. The guitar looks to me like a mid 50's model. I have a picture of a mid 50's Sorella (5/59 model) that looks very similar except the Sorella has a cut-away. So, my guess is that it is either a Rosita model 5/58 or a Tango (5/57) but I can't know for sure since I don't have a picture of either of these 2 guitars. Posted by 1bassleft on Fri, 10/21/2005 - 01:59. Tim, there are Frami semi basses with the "Bill Wyman" connection that people ask money for. Whether they get it is a moot point. Anyhoo, can I ask a few Qs? Are they the original tuners, and you just removed a couple? I really, really would be surprised if they're the original tuners. If they're not, who cares about changing the nut? You're right, it needs to be done toot dasweet to play as a bass. The current spacing is awful. If youi want to re-sell as an acoustic 6er in the future, I doubt if a replaced nut would be the biggest issue. Posted by Tim on Fri, 10/21/2005 - 18:59. Thanks SB, I'll look up some of those models, great site by the way just didn't happen to have what I needed this time, thanks for the advice though. Didn't realise it might be that old, lovely tone for blues though. Posted by 1bassleft on Sat, 10/22/2005 - 02:51. Posted by Tim on Sat, 10/22/2005 - 12:23. Posted by lee_UK on Sat, 10/22/2005 - 23:53. If you do take out the old nut a good tip is to cut around the nut with a craft knife, this will stop the laquer splitting out when you remove it, you should get a block of wood and push it up against the nut (fretboard side) and give it a sharp tap with a hammer knocking the nut backwards towards the head, the new one can then be replaced using instant glue. Posted by Tim on Sun, 10/23/2005 - 13:07. Thanks Lee, that makes sense, I'll think I'll take the plunge...any restoration would need to replace the nut anyway I assume? so it may as well replace the new one cut for 4 strings and in the meantime I get the guitar I want. Posted by lee_UK on Sun, 10/23/2005 - 14:58.